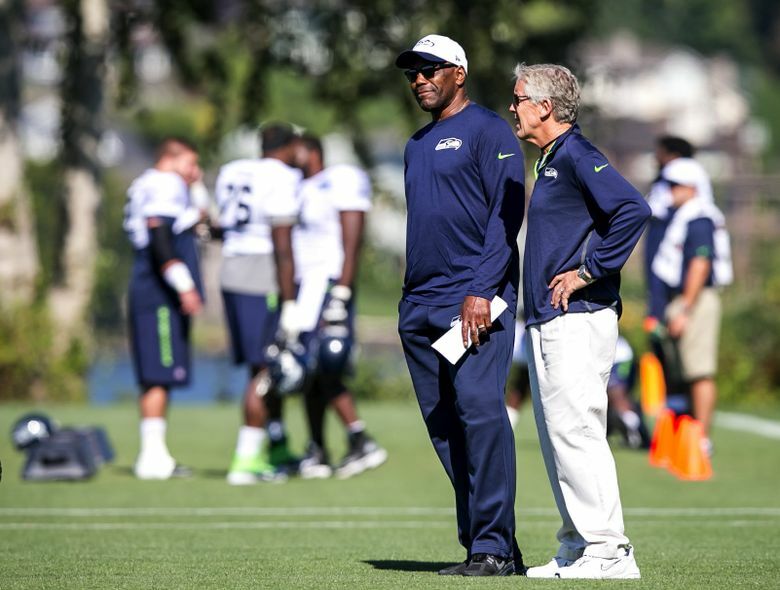 Running backs coach Sherman Smith talks with Head Coach Pete Carroll at Seattle Seahawks Training Camp at the Virginia Mason Athletic Center in Renton, Monday August 17, 2015. Sherman Smith, an original Seahawk as a player and the team’s running backs coach since 2010, will not return next season and will be replaced by assistant running backs coach Chad Morton. The news was first reported by Alex Marvez of SiriusXM NFL Radio and has since been confirmed by the Times. It was also learned Monday night that former Seahawks linebacker Lofa Tatupu, who has been the team’s assistant linebackers coach the past two seasons, also will not return in 2017, apparently for now pursuing opportunities outside of NFL coaching. Tatupu, who played for coach Pete Carroll at USC, then played for the Seahawks from 2005-10, named to the Pro Bowl each season from 2005-07. He had been assisting linebackers coach Michael Barrow, who had replaced Ken Norton Jr. when Norton left to become the defensive coordinator of the Oakland Raiders following the 2014 season. Smith, 62, was taken in the second round by the Seahawks in their initial draft in 1976 and played with Seattle through the 1982 season, gaining 3,429 yards on 810 carries, leading the Seahawks in rushing every year from 1976-79 and again in 1982. He remains seventh all-time in Seahawks history in attempts and rushing yards and is fifth in rushing touchdowns with 28. After spending one season with San Diego in 1983 he returned to the Seattle area and was a teacher and coach at Redmond High for five years before getting into coaching at the college level in 1990 at Miami (Ohio). He entered NFL coaching in 1995 with Tennessee and was the offensive coordinator at Washington in 2008-09 under Jim Zorn. After Zorn was fired Smith then joined Pete Carroll’s first Seahawks coaching staff as running backs coach on Feb. 4, 2010 and has been with Seattle ever since. It was unclear Monday night if Smith will pursue other coaching opportunities. Morton, who has been an assistant running backs coach and assistant special teams coach the past two seasons and also the assistant special teams coach in 2014, played at USC from 1996-99 and then spent seven years in the NFL with New Orleans, the Jets, Washington and the Giants. He entered coaching in 2009, spending five seasons as a coaching administrator and special teams assistant with Green Bay before coming to Seattle in 2014. Morton had taken on an increased role in the day-to-day handling of the running back coaching duties in 2016 with the thought that he would eventually succeed Smith as running backs coach. Smith is the second member of Carroll’s initial 2010 staff to not come back for the 2017 season. Rocky Seto, the team’s assistant head coach for defense, announced last month he was leaving coaching to join the ministry. Seven coaches who have been part of the staff since Carroll’s first year in 2010 remain — defensive coordinator Kris Richard, head strength and conditioning coach Chris Carlisle, assistant strength and conditioning coach Mondray Gee, tight ends coach Pat McPherson, assistant offensive line coach Pat Ruel, special teams coach Brian Schneider, and assistant strength and conditioning coach Jamie Yanchar. The Seahawks were one of the top running teams in the NFL from 2012-15, ranked fourth or higher each season, leading the NFL in 2014 with 172.6 yards rushing per game. But in the first full year without Marshawn Lynch in 2016, and with a rebuilding offensive line and three significant injuries to quarterback Russell Wilson, the running game fell off with Seattle ranked 25th in the NFL at 99.4 per game. It was unclear Monday night how or whether Seattle will fill the two vacancies created by the departures of Smith and Tatupu.